In an effort to bring more geekdom and pop culture to Geeks Who Eat, we are constantly asking ourselves how to do this. Last night while talking about that very subject, we got off on a tangent (not uncommon for us) and went to look up the Ratatouille soundtrack. While searching, we saw something and a spark was created! 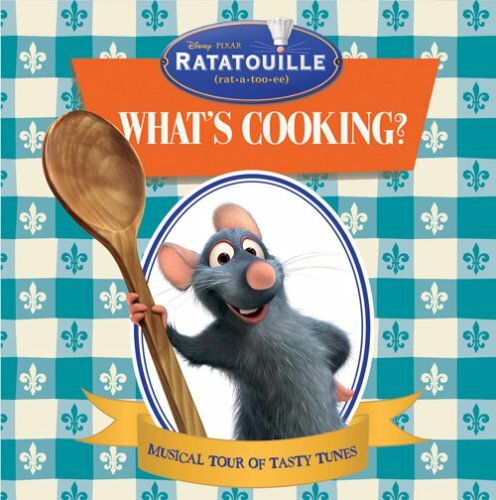 We stumbled on to Ratatouille: What’s Cooking- A Musical Tour of Tasty Tunes. What could be better than an album of music about food put out by Disney in conjunction with Ratatouille? This album is definitely a must listen for foodies. The tone of the album is very upbeat and catchy. It has a mostly jazzy/big band sound fitting with the Ratatouille sound. While the songs are some what juvenile, its all good fun. While listening, we just kept laughing. With lyrics such as “So try the foie gras, it’s so oo la la” and “Pizza is delicious, Pizza is profound”, you can’t help but keep listening. Everyone can find their food anthem on this album, our personal favorites were Cheese Please, Chez Paris, Taco Grande, and French Fries. Initially released in 2007, the album can now be found online on sites like Amazon, iTunes, and Spotify. We will definitely be adding this album to our cooking playlist. What kind of music do you like listening to while cooking? Let us know in the comments or by using the hash tag #GeekEats. Hopefully this review will give you as much inspiration to get into the kitchen as it did us! Happy Cooking! I didn’t know their was an album like this for Ratatouille, I will have to add it to my Disney playlist! Thank you so much for linking up at the Magical Monday Blog Hop, hope to see you again!